The Barrel Cannon, also spelled Barrel Kannon, is an object prominently featured in most of the Donkey Kong titles. Once entered, the barrel shoots the character in the direction indicated by its arrow. They are most often used for crossing large abysses. 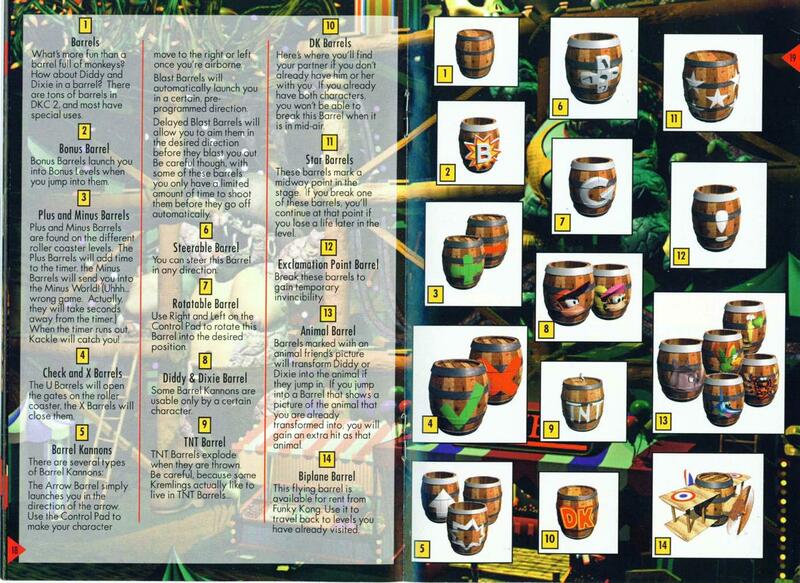 Barrel Cannons appear in all Donkey Kong Country and Donkey Kong Land games. In these games, if a Kong goes into the barrel, it will either stay still, move horizontally or vertically, or spin around. The player can usually blast out the Kongs by pressing the A button. 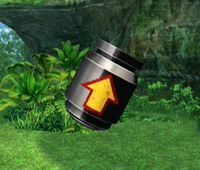 Barrel Cannons may appear in group, which often includes their auto-fire variant, Auto-Fire Barrel; an example of this is in the Donkey Kong Country level, Barrel Cannon Canyon, where Barrel Cannons are prominently featured for crossing wide pitfalls throughout. Blasting from a Barrel Cannon often requires timing, as the player must take various things into account, including obstacles, enemies, or sometimes even other moving Barrel Cannons. This is to avoid crashing into an enemy or obstacle, or falling down a long pit. They come in many varieties in the Donkey Kong Country games, especially in the first three games. These include Arrow Barrels, Blast Barrels, Tracker Barrels, Rotatable Barrels, Steerable Barrels, and Booster Barrels. In Donkey Kong Country Returns, Donkey Kong Country Returns 3D, and Donkey Kong Country: Tropical Freeze, Barrel Cannons only come in four varieties: Barrel Cannons, skull Barrel Cannons, Blast Barrels, and skull Blast Barrels. The skull versions destroy themselves when they fire the Kongs. In Tropical Freeze, Barrel Cannons gain a more rugged appearance, having chipped or faded paint in many places. In Donkey Kong 64, Barrel Cannons take the appearance of red Blast Barrels, though most are not automatic. They are only used by Donkey Kong in the Baboon Blast courses, as well as during the final battle with King Krusha K. Rool. Barrel Cannons can be encountered in New Play Control! Donkey Kong Jungle Beat, replacing the cannon flowers from the original GameCube game. They are completely stationary in this game, and once entered, they will only shoot Donkey Kong in one direction. In order to blast DK out of a Barrel Cannon, the player has to swing the Wii Remote. They also appear in the game Donkey Kong Barrel Blast, along with new varieties in red and gold. In DK: King of Swing, they appear where the player has to jump into a cannon, as it turns left to right, and press the or button to blast into the air. In DK: Jungle Climber, they are easier to aim with. In Super Smash Bros. and Super Smash Bros. Melee, it appears in the Kongo Jungle stages, where it moves back and forth and occasionally rotates underneath the stage. If a character falls into the cannon, they can press the A button to fire themselves out of the cannon in the direction of the arrow. If they wait too long, they will be shot out anyway. Since the cannon sometimes rotates, this action can sometimes save players from falling, or it can launch them to their doom. Only one character may occupy the Barrel Cannon at any time. The Melee version can also be used by Klaptraps that fall into it; they inflict damage if the cannon is touched while they are inside it, or if they are fired towards the stage. In Melee, it is also a usable item. Aside from always rotating and destroying itself upon firing, it works just like the stage variation. This item is quite heavy, thus only Donkey Kong can move around freely while holding it. When thrown, the barrel rolls until it touches a character or falls off the arena. If anyone else touches the barrel while it is occupied, they will take moderate damage. Also, Barrel Cannons disappear much faster than any other item if left alone. Viewing the Barrel Cannon trophy from the bottom reveals the message "2L84ME" ("too late for me"), also seen on a crate in official artwork of Cranky's Cabin. From Super Smash Bros. Brawl onward, Barrel Cannons do not function as a regular item. However, they appear in both Subspace Emissary and Smash Run, and have a new smooth, black appearance and a yellow arrow with a red outline. Characters use these to get shot up higher or break Brick Blocks in their way. Kongo Jungle and its Barrel Cannon also reappear in Super Smash Bros. for Wii U and in the new stage, Jungle Hijinxs; the former stage reappeared in Super Smash Bros. Ultimate. In DK Mountain, which appears in Mario Kart: Double Dash!! and returns in Mario Kart Wii, there is a giant Barrel Cannon (referred to in the former as Donkey Cannon and in the latter as DK Cannon) that blasts competitors to the top of the mountain. A Barrel Cannon with the same function appears in the DK Summit stage of Mario Kart Wii, and in Maple Treeway, but it does not include the DK initials. Another Barrel Cannon is featured in the Mario Kart 8 and Mario Kart 8 Deluxe overhaul of N64 Yoshi Valley, replacing the Long Route. In Mario Power Tennis and Mario Tennis: Power Tour, Donkey Kong mounts and shoots from a Barrel Cannon as part of his Offensive Power Shot, the Barrel Cannon Blast. In Mario Tennis Aces, several Barrel Cannons appear when Donkey Kong's Special Shot animation is triggered, enabling him to perform the shot by launching him from one to another. Barrel Cannons appear in DK's Jungle Ruins board of Mario Party 9. If the player lands on a Lucky Space, they will be launched to a floating island to increase their Bananas counter. Many Barrel Cannons appear in the boss minigames Diddy's Banana Blast and DK's Banana Bonus, where the players use them to reach Bananas. Only a single giant Barrel Cannon appears in Mario Party 10, located at the top of the Donkey Kong Board. Whenever the player's amiibo comes across this cannon, they will be offered the possibility to enter the cannon and get launched to one of the spaces the other players are on. Barrel Cannons return in Mario Party: Star Rush, in the minigame Leafboard Hoard. The objective is for players to select a Barrel Cannon, and competing for one with the most coins, and then launch from that one. Barrel Cannons make a minor appearance in Mario Super Sluggers in adventure mode. When the player travels to DK Jungle, Donkey Kong meets him and says that there is a waterfall too far for him to jump across. Nearby, in a bush, is a barrel cannon which will launch the player across this waterfall. In Mario & Luigi: Bowser's Inside Story and Mario & Luigi: Bowser's Inside Story + Bowser Jr.'s Journey, Mario and Luigi obtain a Special Attack called Yoo Who Cannon where the bros. jump into Barrel Cannons and are shot at enemies. This same attack was planned for the sequel but was removed. Barrel Cannons appear in Mini Mario & Friends: amiibo Challenge as the gimmick of Barrel Blast Jungle. There are stationary Barrel Cannons, which spin around continuously, as well as Barrel Cannons that do not rotate but move from one side to the other on a line. Barrel Cannons display a light-emitting disc, which turns red when Mini Donkey Kong is inside the cannon. If the disc is tapped with GamePad while Mini Donkey Kong is inside, he gets launched from the barrel. Alongside Barrel Cannons, there are also Blast Barrels. In the Donkey Kong Country microgame from WarioWare Gold, the player has to fire Donkey Kong from a Barrel Cannon onto a row of bananas. 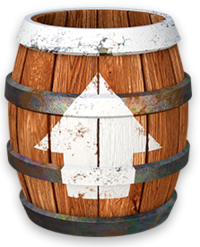 The Barrel Cannon takes the form of a Blast Barrel, although it only fires the character at the player's command. In the first two difficulties, the Barrel Cannon moves up and down, while in the third difficulty, it rotates 90 degrees in one place. "Barrel Cannons are usually suspended in the sky by some unknown force. Once you jump into one you can launch out of it, high in the sky or across great distances. There are two kinds: regular cannons which you press the B button to activate, and automatic cannons which will launch as soon as you jump in. Automatic barrels are marked with a white explosion." "Leap into a Barrel Cannon to get launched into the air. Those marked with an explosion symbol will fire automatically, while others will require a press of the A Button to launch. You'll also find some Barrel Cannons that move, so be sure to time your shots carefully." "There are several types of Barrel Kannon. Arrow Barrels simply launch you in the direction of the arrow (use the + Control Pad to move left or right in the air). Blast Barrels will automatically launch you in a certain pre-programmed direction. Delayed Blast Barrels will allow you to aim them before they blast you out." "This barrel will automatically launch you to places that you'd never be able to reach otherwise." ↑ 1.0 1.1 Donkey Kong Country 2: Diddy's Kong Quest instruction booklet, page 18. This page was last edited on March 8, 2019, at 20:07.